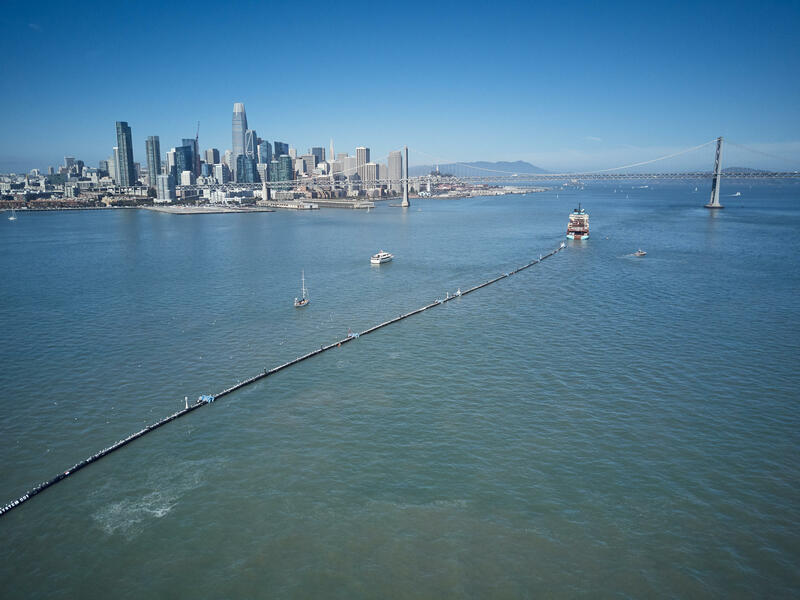 A nearly 2,000-foot-long tube is towed offshore from San Francisco Bay on Saturday. It's a giant garbage collector and the brainchild of 24-year-old Boyan Slat, who aims to remove 90 percent of ocean plastic by 2040. We humans have deposited a huge amount of plastic in Earth's waters. There are now five garbage-filled gyres in the world's oceans — the largest and most notorious being the Great Pacific Garbage Patch, with its estimated 1.8 trillion pieces of plastic, spread across an area twice the size of Texas. One of the people trying to figure out how to clean up the ocean is Boyan Slat, a 24-year-old Dutch social entrepreneur who has been working to invent a solution since he was 17. His idea — for a giant floating system that would corral the plastic so it can be scooped out — is on the verge of reality. He founded a nonprofit called The Ocean Cleanup and picked up a major environmental award from the United Nations along the way. Tech investors including Peter Thiel and Marc Benioff got behind his go-big ethos; a reported $35 million total has been raised. On Saturday, a vessel that usually tows oil rigs instead towed Slat's giant garbage-catcher some 300 miles offshore from San Francisco Bay. For two weeks, engineers will monitor how the system handles the battering waves in the Pacific before towing it 1,100 more miles to the patch. The system's centerpiece is a nearly 2,000-foot-long plastic tube with a 10-foot skirt attached beneath, forming a U-shaped barrier designed to be propelled by wind and waves. Its aim is to collect plastic as it floats — and then every few months, a support vessel would come by to retrieve the plastic, like an oceanic garbage truck. The plastic would then be transported back to land for recycling. If it works, The Ocean Cleanup plans to deploy a fleet of 60 such devices, which the group projects can remove half the plastic in the Great Pacific Garbage Patch in five years' time. But will it actually work? Slat doesn't know. His team has changed its concept over time, switching from a moored system to a drifting one, in order to act more like the plastic it's trying to catch. They tested a prototype on the North Sea but say the Pacific will be the real challenge. "We believe that every risk that we can eliminate in advance we have been able to eliminate," he said in a video prior to Saturday's launch. "But that doesn't mean that all risks have been eliminated. Truly, the only way to prove that we can rid the oceans of plastic is to actually go out there and deploy the world's first ocean-cleaning system." The Ocean Cleanup hopes to reduce the amount of plastics in the world's oceans by at least 90 percent by 2040. But many experts on plastic pollution have expressed concerns about whether the project will be effective. For one thing, most of the plastic that ends up in the ocean doesn't end up in these garbage gyres. "Based on the latest math, we think that about 8 million metric tons of plastic is flowing in to the ocean from land around the world," says George Leonard, chief scientist at Ocean Conservancy. And he says that only around 3 percent to 5 percent of that total amount of plastic actually winds up in the gyres. "So if you want to clean up the ocean," Leonard says, "it may in fact be that the open ocean is not the place to look." Part of the issue is that not all plastic is buoyant. 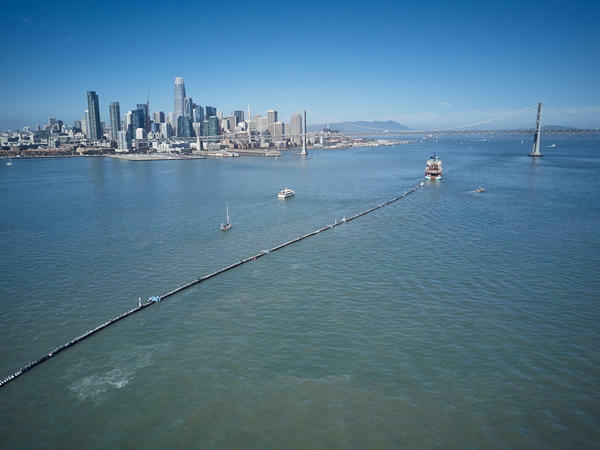 A lot of it sinks immediately — and thus won't be captured by this floating boom, said Eben Schwartz, marine debris program manager for the California Coastal Commission. "It would be wonderful if we can clean up the surface of the gyre, but since so much more of the trash in the ocean actually doesn't end up on the surface of the gyre, it's even more critical that we address where it's coming from and try to stop it at its source," Schwartz recently told NPR's Here and Now. Then there's the question of whether the project might cause unintended environmental consequences. Specifically: Can you capture plastics without ensnaring marine life? "We know from the fishing industry that if you put any kind of structure in the open ocean, it will attract a whole community of animals, both large and small, to that particular piece of structure," Leonard says. Fishermen sometimes create fish aggregating devices (FADs) that intentionally create little floating ecosystems to attract fish. "There's a worry that this could become a very large FAD and attract a whole number of larger fish and marine mammals and seabirds that might be impacted by it," he says. Plus, The Ocean Cleanup's system is made of high-density polyethylene, a kind of plastic. So, what if it becomes part of the problem it's trying to solve? "I sort of wonder what kinds of microplastics this thing is going to be generating on its own, assuming that it's even functioning exactly as designed," oceanographer Kara Lavender Law of the Sea Education Association told Wired. And if the boom gets busted in a big storm, well: "If it's shedding nano-size particles and then gets smashed into 200-meter-long pieces, you're really covering the whole size range there." And then there's the worry that a big, expensive project like The Ocean Cleanup diverts money and attention away from other efforts that are known to be effective — such as waste management policies to keep the garbage from getting into the ocean in the first place. A 2015 study found that China, Indonesia, the Philippines, Vietnam, Sri Lanka and Thailand were the leading sources of plastic waste in the world's oceans. "The science points to about a half a dozen countries in Southeast Asia which are rapidly developing economies that are heavily reliant on plastic, and lack the kind of waste management infrastructure that I think many of us in the U.S. take for granted," Leonard says. He points to one low-tech way to help fight plastics in the ocean: Pick up trash in your own local waterways. His organization's annual International Coastal Cleanup takes place Sept. 15, when he says nearly a million people are expected to work to remove some 20 million pounds of trash from beaches and waterways around the world. Leonard says the Ocean Conservancy is skeptical that the giant trash collector will work, "but we're being enthusiastic, and we hope it does." "The ocean really needs all the help it can get."